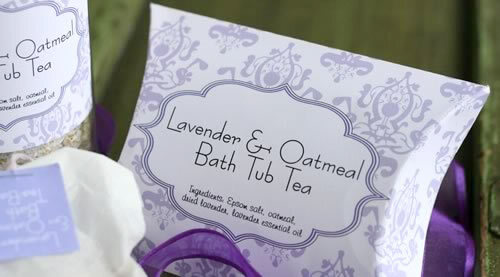 A homemade oatmeal bath tea recipe with with added lavender and Epsom salts for a luxurious soak! 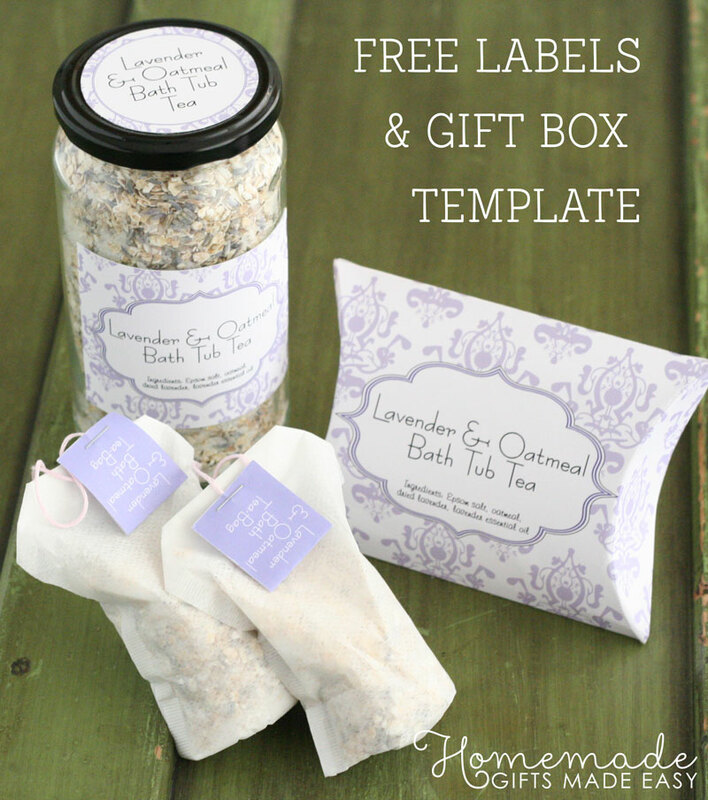 Simple to assemble, and with free printable labels, this bath tub tea makes a beautiful gift. 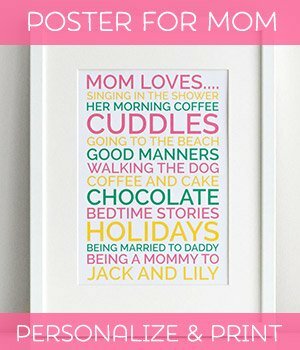 I'm helping to organize a Christmas craft night with my Mother's group in November, and I wanted a simple craft we could all manage to complete in our baby-frazzled state! And preferably something slightly indulgent, relaxing and pretty too! I saw some giant bath tea-bags for sale in a British tea shop "Whittards of Chelsea" a few years ago and I always wanted to have a go at making some myself, so this was the perfect excuse! There are some fabulous blog posts for homemade tub tea, such as radmegan , garden therapy , and evermine , and I've taken inspiration from these for my recipe. The plan for the craft night is to make two tea-bags each, and put them in these little pillow boxes I designed. I think they look gorgeous but I may be slightly biased. 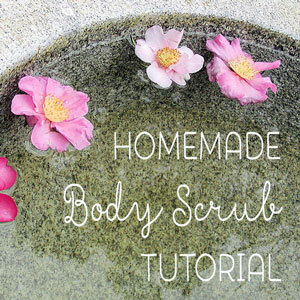 In this tutorial I'll show you how to make homemade oatmeal bath tea with relaxing lavender, soothing oatmeal and Epsom salts. It's so easy to assemble, and I've included printable labels for making either bath tea bags or a jar of loose bath tea. The quantities listed here will make one 500 mL (18 fl. oz) jar of bath salts or six size-3 tea-bags. Vary the quantity according to your needs. You can read more about the benefits of oatmeal, lavender and Epsom salts further down the page. *For the empty tea-bags, I used size 3 T-Sac disposable paper filter tea-bags which you can buy on Amazon. 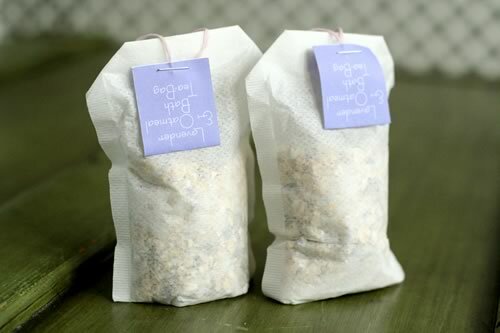 If you want to package up your homemade oatmeal bath tea as a gift, you can download our free labels here. Print onto thick paper rather than regular printer paper for a nicer finish. I used matte photo-quality paper for this project. Please note these labels and pillow box template are an original design by homemade-gifts-made-easy.com, and are for personal, non-profit use only. And here is a link to download our pillow boxes - each box will fit two tea-bags. For assembly instructions, please refer to our pillow box tutorial . 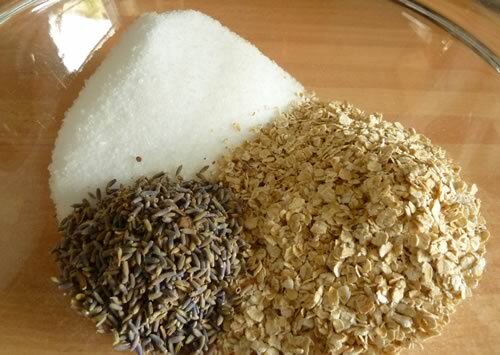 Measure out the oatmeal, Epsom salts and dried lavender in to your mixing bowl. Add 1 mL lavender essential oil and stir to combine. Spoon your tea mixture into your empty glass jar using a funnel (or rolled up piece of paper). Fill to the top and close your jar. 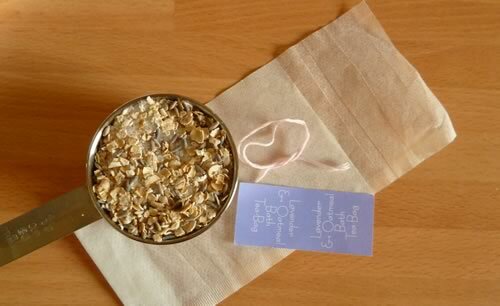 Now you can decorate your jar with our free printable homemade oatmeal bath labels . 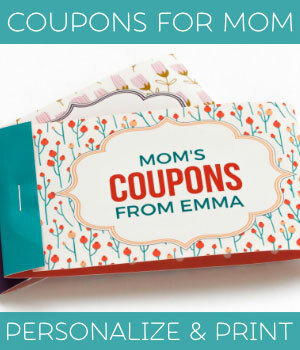 Download, print and cut out labels. I find it best to print onto slightly thicker paper (I used matte photo-quality paper here). Use double-sided tape to attach labels to the jar. You can present your jar with a metal tea or spice infuser if you want, so that the recipient won't be floating in a bath tub of oats and lavender buds! 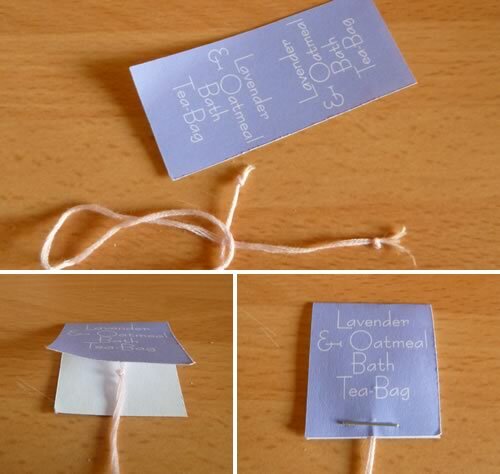 For each empty size 3 tea-bag you will need 1/3 cup of oatmeal and lavender bath tea mixture, a tea-bag tag, about 6 inches (15 cm) string, and a stapler. Firstly tie a double knot at each end of your string. Fold the tea-bag tag label in half over one end of your string. Staple together to close shut. The knot will prevent the string slipping from out. Pour 1/3 cup of tea mixture into the empty tea-bag and fold closed. Tip: It is possible your tea-bags are a different design to mine depending upon the brand. If so, just come up with your own folding method so that the end result looks a bit like a tea-bag from your cupboard! Some empty tea-bags are heat-sealable, so you could even iron them shut. Or you could sew across the opening. Another option is to use little organza or muslin bags. 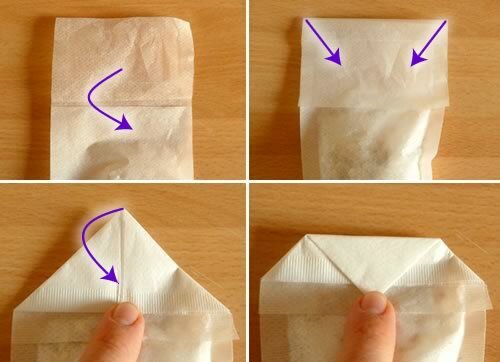 To fold your tea-bag shut follow the steps below in the pictures. To close off, I stapled my tea-bag shut. When you staple shut, be sure to staple over the other end of the string. It doesn't have to be flush with the staple, as you can pull it tight once you've stapled. The double knot will keep it in place. Here are some finished tea-bags. I wish you could smell them too! Don't forget to print out the free pillow box (fits two tea-bags). 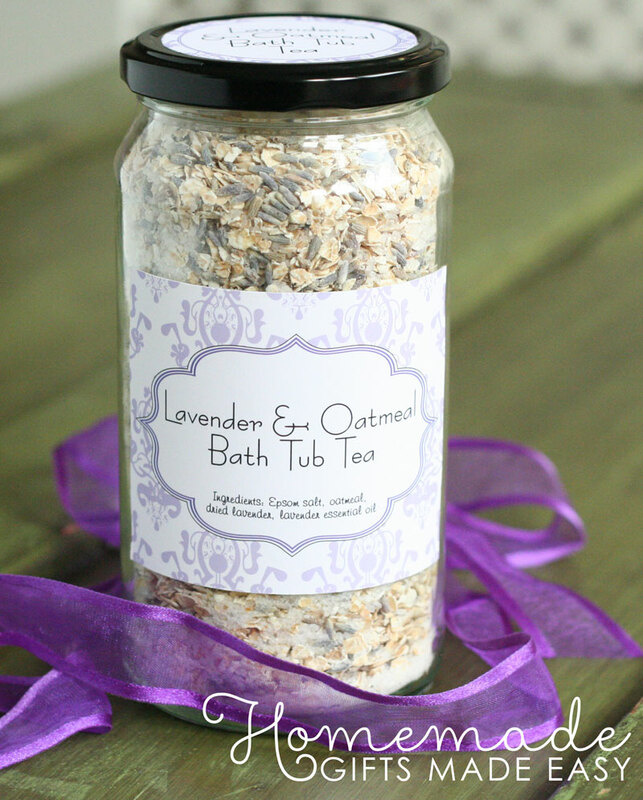 I hope you enjoyed my homemade oatmeal bath tea recipe with lavender and Epsom salts! Please leave a comment if you have any questions or just want to say hi. Oatmeal is well known for its ability to soothe dry, irritated and itchy skin. 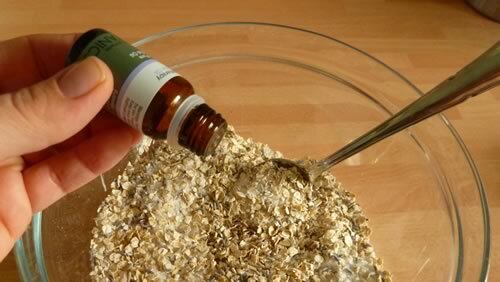 Many people bathe in powdered oatmeal to relieve skin conditions such as eczema, poison ivy rash and chicken pox. Published scientific research has identified several anti-inflammatory agents in oats that act to reduce skin irritation, so it really does work! 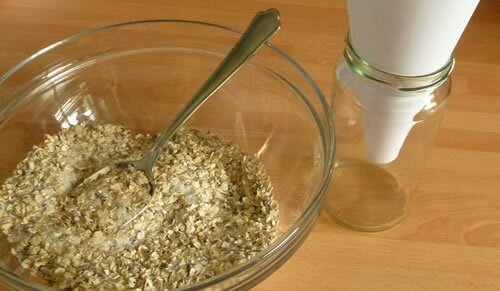 But rather than buying expensive over-the-counter oatmeal preparations, it is easy to prepare a homemade oatmeal bath by finely grinding your own oatmeal at home and adding it directly to your bath water (add about 1 cup per bath, less for small children). 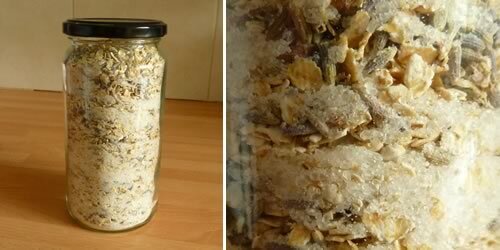 If you're looking for a luxurious and silky homemade oatmeal bath, but aren't in need of an all out submerge in ground oatmeal, try putting a handful of oats in an empty stocking or muslin bag (or bath tea bags) and close off. Hang your bag under the running bath water and then submerge it in the bath. You'll still find the water turns milky, and you can rub the oat-bag onto your skin (and any problem areas). It feels amazingly silky and moisturizing. Lavender, my favorite essential oil, is well known for its soothing, calming and restorative properties in conditions such as anxiety, depression, irritability, headaches, migraines, and stress. 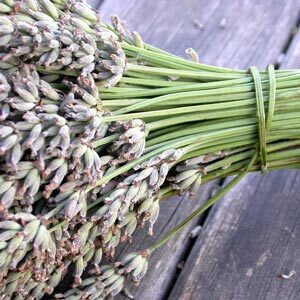 It has been shown to aid healing of cuts, scrapes and burns with its antiseptic and anti-inflammatory properties. 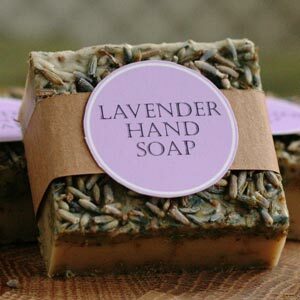 Interestingly, the ancient Romans used lavender to scent the public baths, and the very name 'lavender' comes from the Latin lavandus, meaning 'to wash'. So it's a perfect ingredient for our bath tub tea! Epsom salt, a pure mineral compound of magnesium and sulfate (sulphate), is highly soluble in water and has been long used in bath salt preparations for treating aches and pains and soothing sore muscles. Do note that if ingested it also has a laxative effect, so beware of this if you have small children who tend to drink the water (like my toddler does)! Looking for more skin care advice? 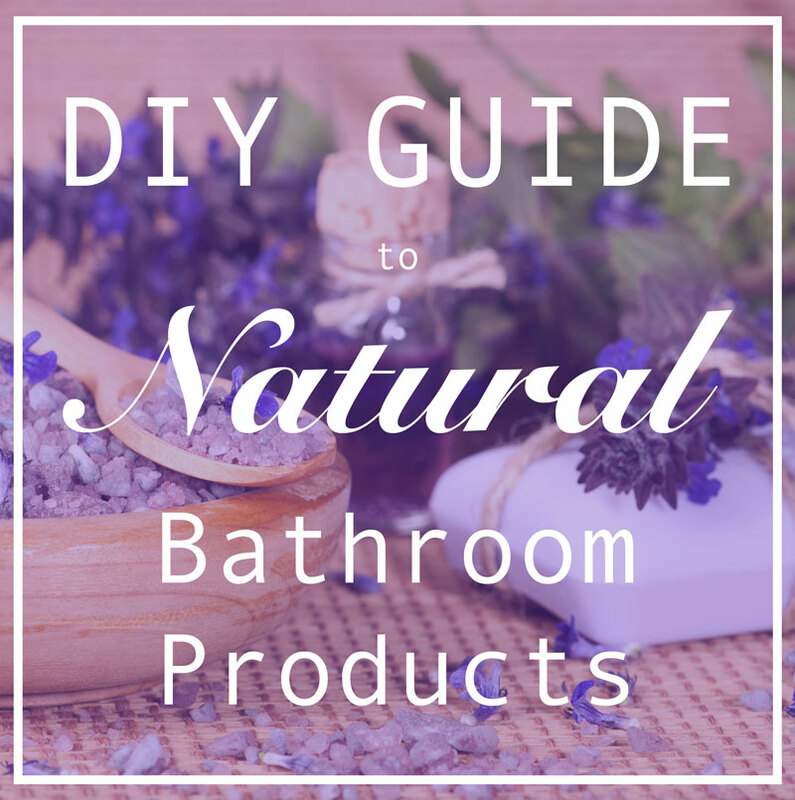 Our comprehensive guide to DIY natural bathroom products can help you reduce your exposure to toxic chemicals and look after your family.